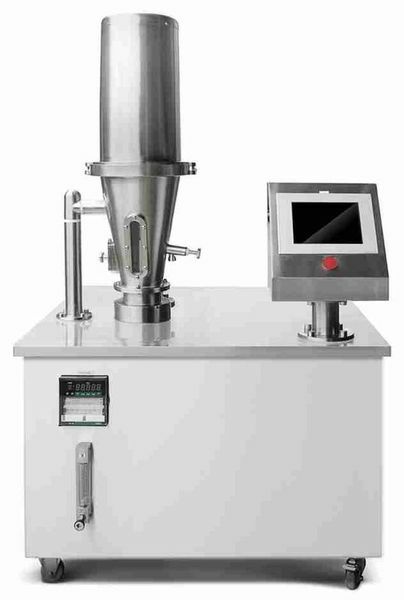 Drying wet granule or powder; granulation and drying of spraying binder on tiny powder. Spray suspension on pellet or film / enteric coating. Pellet powder coating; suspension coating or film / enteric coating. 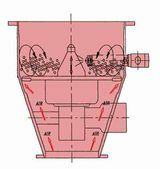 Heated and purified air flows into the column by suction fan, the pellet or powder will be in uniform fluid condition inside the column, use one set of filter bag to prevent leak of powder, discharge the evaporated water to get drying purpose. will be dried to get the required moisture content. 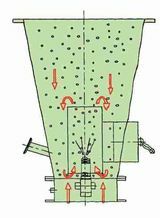 When the hot air flows through the bottom screen of coating column, it will generate siphonal principle. Convection is created through the strong force the granule will be sucked into the coating column and floating from bottom toward top, then fall down again, the bottom spray gun will spray upward into the uniform fluid granule to get coating and drying purpose. Place the sugar cores on the turntable. Hot air is blown upward between turntable and granulation area. 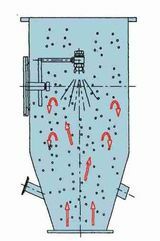 The air causes the cores to roll, the binder solution is sprayed on the rolling cores through the pump and spray gun, coating and drying simultaneously. If powder coating is required, the fixed volume powder will be sprayed at the same time let solution coating the powder on the cores to produce pellet and get coating and drying purpose. 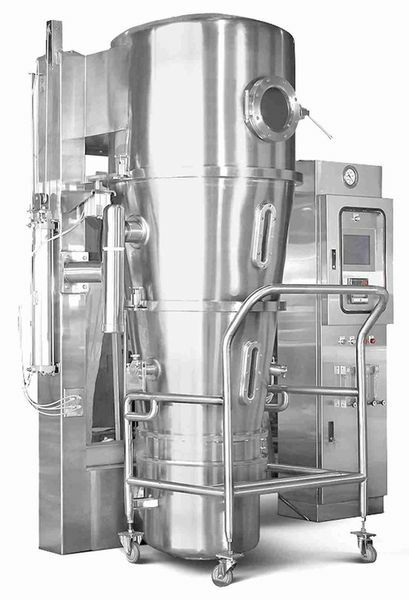 Pharmaceutical: granulating and drying of Chinese or Western medicine, Bio-tech products.  Instant food: granulating and drying for instant powder of health food; juice extract powder; meat extract powder; seasoning; lactic acid bacteria.  Chemical: drying of dye and synthesis raw material. Produce pellet of medicine and health food.